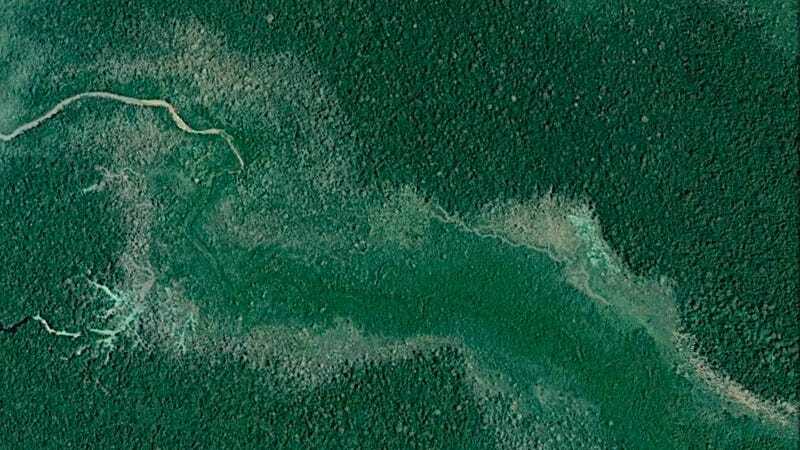 In 1996, a tree fell in the Bolivian Amazon, jamming up a river like a chicken bone lodged in a drain. 119,000 acres of forest died in the catastrophic flooding that ensued. Twenty years later, new research has concluded that this wasn’t a one-off event: So-called ‘logjams’ are constantly reshaping vast swaths of western Amazonia. “I became very curious,” he told Earther. That curiosity led Lombardo to hunt for papers describing what could be causing rivers to clog up suddenly, spilling their contents into the surrounding forest. All he could find was a study from 1996 describing a logjam in the Cuberene River in Bolivia that caused a large area of forest to die off and regenerate as savanna, a grassland peppered with trees. Another study by the same author explored how satellite imagery can be used to identify logjams, but Lombardo could find no follow-up research detailing how prevalent these natural events actually are in the tropics. To find out, Lombardo downloaded Landsat satellite imagery of a 9,300-square-mile swath of the Bolivian rainforest, captured from 1984 to 2016. He identified 22 rivers that showed signs of logjam-induced flooding, and analyzed eight of them in detail, tallying up the total number of logjams and exploring how these events impacted the surrounding forest. The results, published recently in Earth System Dynamics, showed that logjam induced floods are “a major driver of forest disturbance in the Bolivian Amazon,” affecting hundreds of acres of forest, often on an annual basis. Logjams affect rivers in characteristic ways, drying up the downstream channel and diverting water into the forest in a v-shaped area. This is just a single exploratory study, of course. Much more research is needed to suss out how prevalent logjams are throughout the tropics, and how the ever-increasing human footprint in rainforests, including deforestation, affects these natural events. In the Bolivian Amazon at least, Lombardo thinks logjams help shape forest composition, and drive regeneration. When you’re out in the rainforest, he says, the effects of these river clogs aren’t subtle. And you thought a single tree couldn’t make a difference.